During the bike boom of the early 1970’s, Kevin Babcock was hired by Harry R. Beach, owner of Beach’s Bike Shop, Endicott. At that time, single-speed fat tire and three-speed bikes were quickly being overtaken by the European ten-speed with racing handlebars. It was Babcock’s job to assemble, repair, and later sell these bikes for Mr. Beach. On any given day, dozens of new bikes would be sold, thus, Mr. Beach had a staff of good young workers. As co-workers, Kevin Babcock met Dale Buckthal, a collegian whose passion was bikes and anything related to bikes. A lifelong friendship was formed and many miles traveled together on wheels provided by their mentor, Mr. Beach. 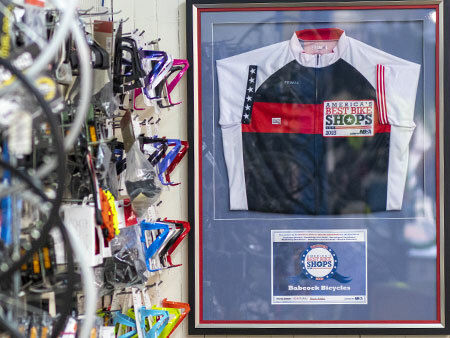 Late in the 1970’s, Mr. Beach passed away and Beach’s Bike Shop became Ted’s Bike Shop, as Jan and Ted Makoske bought the 40 year old business and gave it a facelift. Through the passing of the ten-speed, to the mountain bike, to the specialty bikes, such as hybrid and comfort, Ted, Jan, and their family built friendships and sustained the reputation of the Twin Tier’s largest and best-known bike shop. At the same time, collegiate Buckthal turned into Mr. Buckthal, teacher, and opened a bike shop in Owego, NY, involving Babcock. With Dale Buckthal’s encouragement, Kevin Babcock broke off on his own. In June 1981, Babcock gained a bit of notoriety. The crossing of the U.S. from Los Angeles to New York City was becoming the rage. Ithaca’s Jim Black was sponsored by Lotus Bicycles to attempt to break the trans-continental record of 14 days. Babcock was hired to be the mechanic on the handful of state-of-the-art Lotus Bicycles. Although the record attempt failed, the experience gained on the road was invaluable. Shortly after the cross-country journey, Babcock went full-time into the bicycle business and also worked closely with his friend Dale Buckthal, as Buckthal was laying the corner stone for what would be known as the Tioga Velo Club. As the monthly time trial turned into the weekly time trial, and even some road races, Babcock began to focus on the business aspects of cycling. Babcock began to pack more and more into the rented space at the corner of Main and Page. In the mid-1990’s, John Martens became Babcock’s right-hand man. John’s organizational abilities, along with Babcock’s quality oriented assembly and repair processes, resulted in a loyal following. The year 2004 brought with it a new sense of excitement. One thousand square feet will only hold so many bikes, parts, and accessories. On September 7th, Kevin Babcock purchased Ted’s Bike Shop. Jan and Ted have felt the urge to live life to its fullest. Without the constraints of having to work every day, they can now bike ride, sail their boat, or be able to visit their much-loved family. Kevin Babcock has vowed to merge all of the best features of Ted’s Bike Shop and Babcock Bicycles into one extraordinary biking experience. Ted has said, “It’s two great names under one roof”. Well said. Stop by and visit us soon.